When should you begin Social Security benefits? That depends! If you are married, determining when to start receiving Social Security benefits becomes more complicated. Social Security benefits for spouses are not cut-and-dried. Benefits for a divorced spouse, Social Security survivor benefits, and working or non-working spouses are regulated by a different set of rules. While everyone wants to maximize the amount received, doing so will require thinking through multiple options. To help understand the basics, let’s review various scenarios featuring Walter and Susan. 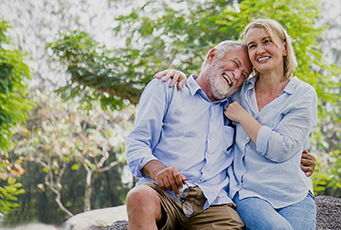 Once you retire and begin receiving Social Security benefits, your non-working spouse can begin to receive benefits if he/she is age 62 or older and you’ve been married for at least one year. At age 62, your spouse is eligible for 35 percent of your benefit. If your spouse is full retirement age (FRA) or older when making the claim, that amount increases to 50 percent. Scenario #1: Walter retires at his full retirement age of 66 years and claims his $1,500 per month benefit. His 62-year-old wife, Susan, is eligible to receive approximately $525 per month on Walter’s record. However, if Susan waits until her FRA age of 66, she can receive 50 percent or $750 per month (adjusted annually for cost of living). Scenario #2: Walter decides to work to age 70 and waits to collect Social Security until that time. At age 70, his monthly benefit increases to $2,040. Susan has now reached her FRA of 66. So, will Susan collect more in this scenario? No. She is still only eligible for 50 percent of Walter’s FRA benefit, or $750 per month. She doesn’t receive half of his age-70 benefit, only half of his FRA benefit! If your spouse has earned forty credits or worked approximately 10 years, he/she can claim retirement benefits on his/her own record as early as age 62. He/she also has the option of filing for benefits as the spouse of a retiree. Your spouse will receive whichever amount is larger, i.e. claiming on his/her own record or claiming on your record, but not both. Scenario #1: Susan just retired and has sufficient credits to file on her own record. At her FRA (age 66) she would receive $700, but she decides to start claiming a reduced benefit of $525 at age 62. Her husband, Walter, continues to work to his full retirement age (age 66) and begins claiming his full benefit amount of $1,800. At that time, Susan can claim on Walter’s record. However, the amount will be permanently reduced as she claimed on her record early. Her 50 percent spousal benefit ($900) is reduced by the amount of her FRA benefit ($700). Therefore, Susan will receive an additional $200 on Walter’s record making her combined benefit $725. If she had waited until her full retirement age, she would have received $900. Scenario #2: Restricted Application is only available for those born on or before January 1, 1954. Both Walter and Susan are full retirement age. Walter has retired and started collecting his $1,800 monthly benefit. Susan plans to work to her age 70. Since both are full-retirement age, Susan can file a restricted application and claim 50 percent of Walter’s benefit and continue to let her benefit amount grow until she retires. At retirement, she can then claim on her own record if it is higher than half of Walter’s benefit. If Walter dies before Susan, she can claim benefits immediately if they have a child under age 16. Once their child turns 16, the benefits are discontinued. If there are no children under age 16, Susan won’t qualify for benefits until she is age 60. At age 60, the benefit is 71.5 percent of Walter’s benefit. If Susan waits until age 62 to receive benefits, she’ll receive approximately 82 percent of Walter’s benefit. Her benefit increases to 100 percent of Walter’s if she waits to her full retirement age before filing. If Walter was already claiming benefits, Susan is eligible for the highest benefit amount. Let’s assume that Walter started Social Security benefits at his FRA of 66 with a monthly amount of $1,500, Susan is then entitled to survivor benefits of $1,500. If Walter delayed his Social Security to his age 70, then Susan would receive his age-70 benefit amount of $2,040. What Happens If You Divorce? Social Security benefits for the divorced spouse are still an option. If Susan and Walter divorced, Susan would be eligible to receive benefits as a divorced spouse on Walter’s Social Security record provided she meets the following requirements: married for at least 10 years, divorced for at least two years, age 62 or older, currently unmarried, and not entitled to a higher Social Security benefit on her own record. As an ex-spouse, Susan would not need to wait for Walter to claim benefits to be eligible to claim on his record. And, her claiming does not in any way reduce the benefit amount Walter will receive or what an eligible spouse will receive in the event Walter remarries. In order to choose the best timing for taking benefits, consideration must also be given to the current health of both spouses; ability/desire to continue work; living expenses; and other sources of income. For more information, visit the Social Security Administration website at www.ssa.gov.